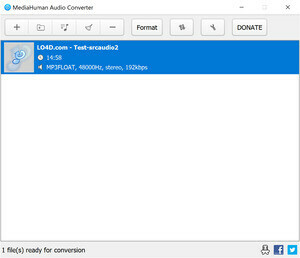 MediaHuman Audio Converter is an easy-to-use tool which can convert your audio files between multiple different audio formats. It supports MP3, WMA, AAC, WAV, FLAC, OGG/Vorbis and AIFF audio files. One thing to note about MediaHuman Audio Converter is its ease-of-use, thanks to the very simple user interface layout. It can convert files by dragging files from Windows Explorer and hitting the "Convert" button. Version 1.9.6.4 is a freeware program which does not have restrictions and it's free so it doesn't cost anything. For security reasons, you should also check out the MediaHuman Audio Converter download at LO4D.com which includes virus and malware tests. Additional screenshots of this application download may be available, too.